I warned you that things would get repetitive around here. And here we go again, another comforting, tomato-cheese-pasta dish that I would happily eat every day. Before I go on, I just want to put in a disclaimer (law school is teaching me something, perhaps? 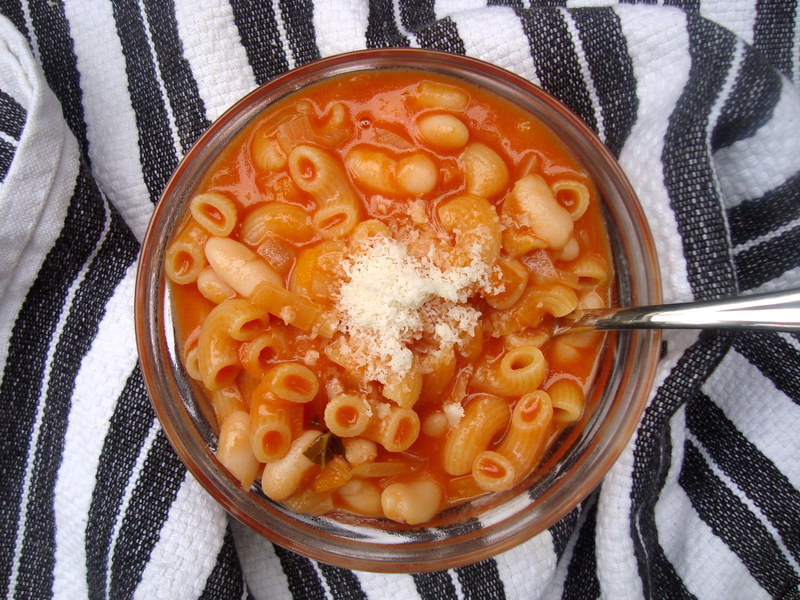 ): this is not your classic pasta e fagioli and I will not purport to have recreate a classic of Italian home cooking. This, my friends, is the closest version I’ve found to my all time favorite kind of Progresso soup that my parents have kept (and still keep) stocked in the pantry ever since forever: Macaroni & Bean. My siblings were Chickarina fans, but me? I was always and only about the Macaroni & Bean. It was a love I shared with my best friend when we were 7 or 8. It, along with goldfish, tuna sandwiches, ice cream and cookies out of her mother’s cookie jar, was just about all we knew how to feed ourselves. I even had a preferred method of consumption: first I would eat the celery and beans, saving the pasta for last when I would slurp it all up, swallowing it whole. Back then, I could split a can. Nowadays, I wouldn’t be so generous. I even once shared a romantic, candlelit meal on the floor of my 15 sq ft dorm room (we used a suitcase as a table) consisting entirely of Progresso Macaroni & Bean Soup. The romance didn’t last but my love for the soup is stronger than ever. 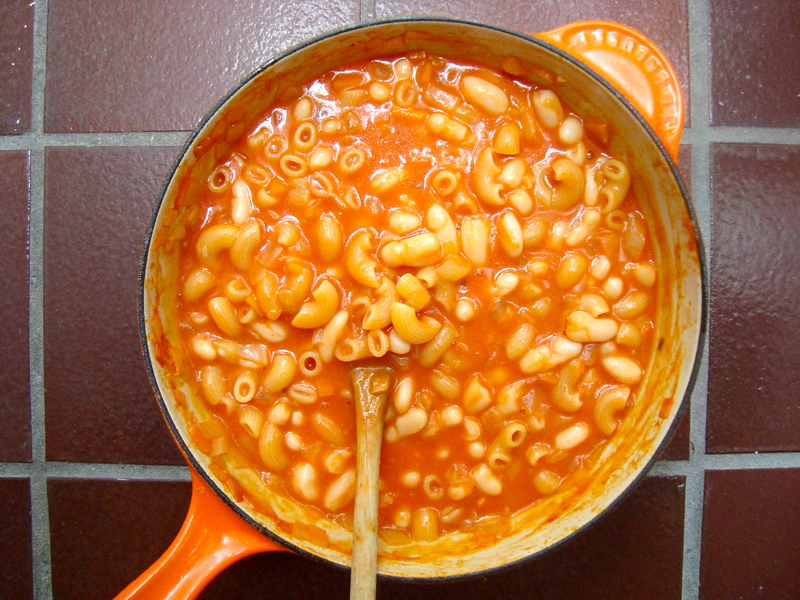 Rest assured, I would have never gone to the trouble of making my own Macaroni & Bean soup when I already know the original is as good as it gets. But, as with so, so many things, there is no Progresso soup in Australia. I contemplated asking my mom to send me a can or two, but couldn’t bring myself to be so childish and selfish. The shipping alone would cost as much as 10 cans of soup, and who knows? One of the Australian customs officials may have once tried Progresso soup on a brief trip to civilization, and would greedily quarantine my deliciousness all for himself. Besides, it would take at least 8 or 9 days for a package of soup to arrive. And I couldn’t wait that long. After some interneting revealed nothing (besides the fact that you can buy an entire case of Macaroni & Bean soup, which, if I were you, and you’re in the States, I would have done yesterday and also revealed the ingredients in the original), I started looking for recipes and settled on the one that looked closest to the real thing. 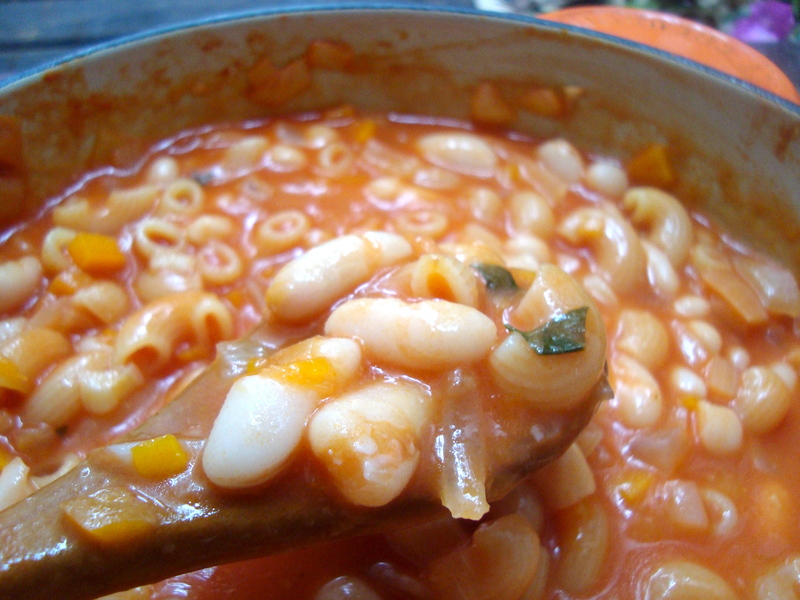 This is as close as I think you can get to the wonder of Progresso’s Macaroni & Bean soup without the can. I kind of based the recipe on this recipe from Recipe D’Eva, but adjusted it to reach optimal Progressoness. A lovely feature of the Progresso version is the chunks of mushy celery; I didn’t have any celery and none of my neighborhood shops did either so we did without. Also, Progresso uses Great Northern beans but – sigh – I couldn’t find any in this cultural wasteland known as Australia. Feel free to use cannellini if you’ve already got them. Also! Read my nota bene at the end of the recipe if you’re planning to make this ahead of time. In a large saucepan over medium heat, saute celery, onion and garlic in a good splash of olive oil over medium heat until onion is translucent, about 10 minutes. Stir in broth, tomato sauce, about 1/4 of the grated cheese, and the rosemary and basil. Bring to a boil then lower heat and simmer for 15 to 20 minutes. Add about 1/2 – 1 cup of milk. It’s okay if the broth looks too watery, it will thicken considerably once the pasta is added. There are two ways to finish this off: the lazy way, which means you cook the pasta straight in the soup and requires you adding significantly more liquid OR the right way, which means you cook the pasta for half the time indicated on the package then add it to the soup, where it will continue to soak up some liquid even if the soup isn’t at a boil. Choose which cooking method you want to use, lazy or right. LAZY WAY: For the lazy way, just turn up the heat under the soup to a boil, then add the pasta (I do about 1 small handful per person) and cook, stirring constantly to avoid sticking, for 5-10 minutes or until pasta is tender. Test the pasta as you go; it will take longer than the time stated on the pasta box. 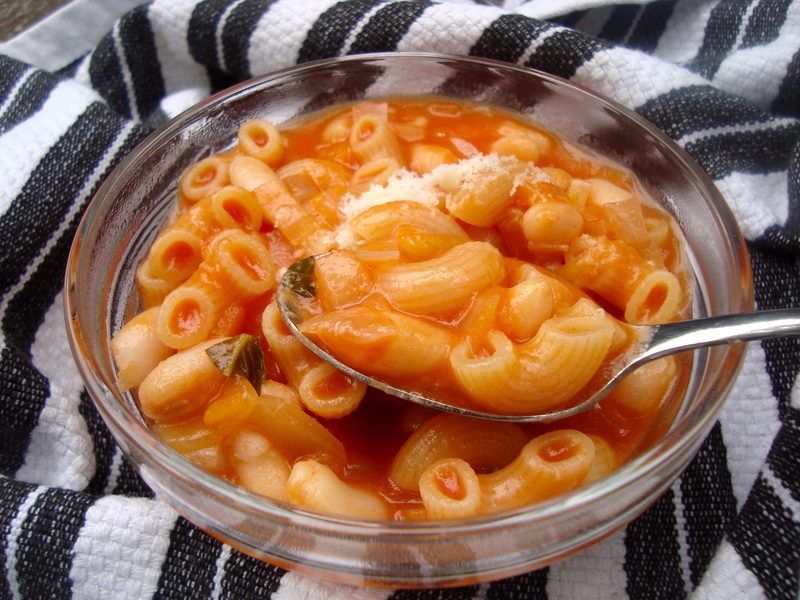 If the pasta seems to be soaking up too much liquid and it’s becoming more like a soupy pasta rather than soup, add enough milk to bring it to your desired consistency. Remember, the pasta will continue soaking up liquid (and becoming mushier) even after you turn off the heat. Once the pasta is al dente, add the undrained beans, mix well and after a minute turn off the heat. Serve with remaining grated cheese sprinkled on top and crusty bread to mop it all up. RIGHT WAY: If you want to make it the “right” way, bring a small pot of water to boil. Add a generous amount of salt and cook the pasta for a little less than half the time on the package (if it says 9 minutes to al dente, for example, cook it for 3 – 4 minutes). Scoop the pasta out of the boiling water with a slotted spoon at the halfway point and put it directly into the soup pot. It will continue to soak up liquid. Add milk as necessary and heat to desired temperature to serve. Add the undrained beans, mix well and serve with extra grated cheese on top. Nota bene: no matter how you cook it, the pasta will continue to soak up the broth, it’ll just soak up considerably less if you cook it separately (the “right” way). If you want to be lazy – and I usually do – it’s best not to make it too far in advance, or the pasta will be unpleasantly overcooked and there’ll be no broth to speak of. If you do need/want to make it ahead, just don’t add the pasta; when you’re ready to serve, bring the soup to a boil, add the pasta and a bit of extra liquid as necessary. Remember: the pasta will soak up the broth even after you’ve turned off the heat! I learned this the hard way. Um, woah. 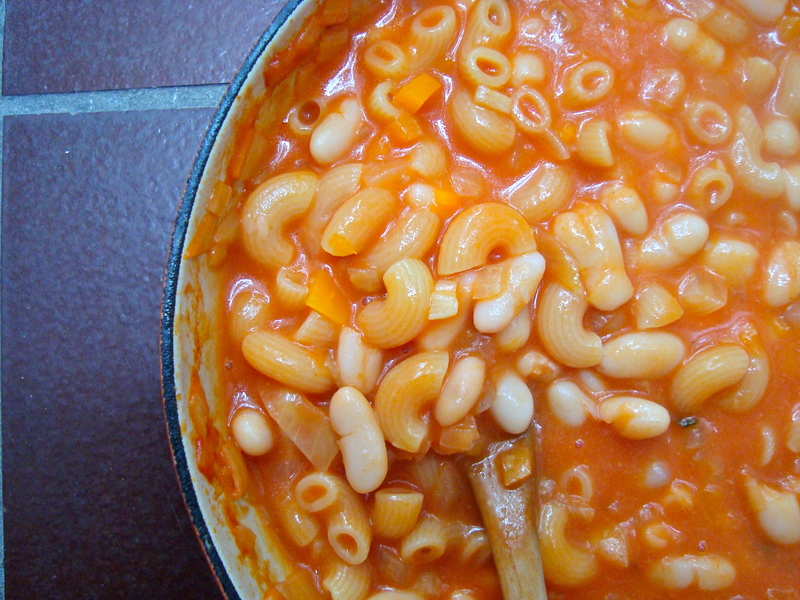 Macaroni & Bean soup is my childhood favorite as well. So much so that, when my doula suggested I bring a special “comfort food” to the hospital with me to eat after childbirth, I knew exactly what it would be (Note: It was perfect). Alas, I live in western Canada, were we also, sadly, do not have Progresso. And for some marketing reason, apparently Macaroni & Bean is not sold in the western US, so even when I venture south of the border I turn up empty-handed. I’m left having to rely on my in-laws to smuggle it in from New England whenever they visit. I am always sure to have a few cans stashed away in my cupboard (for emergencies). But now my three-year-old has discovered the joys of Macaroni & Bean as well and, while I am happy to share a passion with her, I am not so happy to share my dwindling stash of soup. My husband, good man that he is, went out hunting and found this post of yours today. Cannot WAIT to try it! From one ex-pat to another, thank you! This is hilarious! When my friend visited me from the States, she brought 5 cans in her suitcase. I still have one lowly can high in a cupboard somewhere. I wonder if I’ll ever actually open it (I don’t even think my impending hospital stay will be enough incentive), but it’s so good to know it’s there. This recipe is not bad at all (it’s actually really delicious), and, until Progresso shapes up and starts distribution abroad, it’s all we’ve got! From one Macaroni & Bean lover to another, buon appetito! Progresso’s Macaroni & Bean is my husband’s favorite too. Thanks for this recipe, he loved it (and I did too!). Macaroni & bean is my favorite as well! It took a hiatus from my life as after awhile we couldn’t find it anymore in Cleveland, but it reappeared when I moved to Cincinnati. Alas, I am sick today and the grocery store is out. May have to make your version to hold onto for emergencies. If only I had some tomato puree I could make it right now and I am really jonesing for it! It ‘s a conspiracy! All the places that used to carry Progresso’s Macaroni & Bean soup have stopped carrying that variety. Still have Progresso, but no Mac & Bean. I read a blog a while back, written by an author who stockpiles the stuff. Wondering now where she can find it. I used to bring it back from Michigan or Oklahoma, but can’t find it in either place, anymore. It’s nowhere to be found in Las Vegas, California, or Arizona. My kids became attached to it growing up in New York. I have heard you can order it directly from Progresso, but you won’t find any sale price, and the shipping will kill you. My son found this recipe, so we’re making it tonight. I hope this fills his void! I too found this soup and have been buying it in Arizona, when suddenly it disappeared off the shelves. I have one can left and then looked this up on the internet – we are anxious to try this (my husband loves it too). Thanks!!! you boil the macaroni like you would regular pasta just cook it separately and add in afterwards. Seemed like too much effort for me 🙂 But yes, of course you can do that and the pasta won’t soak up as much liquid. Progresso macaroni and bean is my favorite soup . It is the only soup that I ever buy in a can , rest always being homemade . Some claim there is cancer in the canning,and of course all that sodium and other unhealthy things , I’m really glad that I tried your recipe. It definitely the closest I’ve ever tasted.. I am so enjoying it as we speak ! Thank you ! I’m so glad you tried and liked it! The Progresso is so good, I’m just glad we’re able to kinda sorta recreate it! I just made this soup and it’s delicious especially for a fast soup. I used frozen soup vegetables in place of fresh….and jarred garlic….and I hit it with a little hot sauce at the table. I’m gonna make this again easy and delicious. Tammy, I’m so, so glad you made and love it! Makes me really happy (and really craving a batch right now…) Thanks for writing! Maybe if you precooked the pasta it wouldn’t soak up the broth. Try it. That would make it alot easier to make ahead of time. Such a good idea! I’m usually too lazy for this sort of thing but it’s definitely worth the extra minimal effort. Thanks, John. Directions indicate nothing about the beans or the milk.